Lehigh Valley (0-0) v Pawtucket Red Sox – Postponed: Rain, make up in Sunday double header. Everybody pushed back – Jake Thompson on Friday, Ricardo Pinto on Saturday, and Ben Lively and Nick Pivetta on Sunday. Reading (0-0) v Portland Sea Dogs – Postponed: Rain. Tom Eshelman on Friday, Tyler Viza on Saturday, Drew Anderson on Sunday, Shane Watson on Monday, and Brandon Leibrandt on Tuesday. Clearwater (1-0) beat the Dunedin Blue Jays 3-1 behind strong pitching performances by Zach Eflin, Seranthony Dominguez, and Jeff Singer. Next up Jose Taveras on Friday, Franklyn Kilome on Saturday, Cole Irvin on Sunday, Alberto Tirado on Monday, and Blake Quinn on Tuesday. Eflin was making a rehab start and was limited to five innings or 75 pitches. He made the most of his appearance going 5.0 IP, 1 H, 0 R, 0 ER, 0 BB, 6 K. He threw 56 pitches/44 strikes. His fastball sat at 93-94 mph although his range was 91-96 mph. His last pitch of the evening hit the catcher’s mitt at 95 mph for his sixth strike out. The Jays game plan seemed to be to take pitches. They took 14 of 17 first pitches from Eflin. He took advantage and threw 13 of 17 first pitch strikes. Eflin had impeccable command. He only threw 12 balls and threw more than one ball to only one batter, his only three-ball count which ended in a strike out. Seranthony Dominguez followed and threw 2.0 IP, 1 H, 1 R, 0 ER, 1 BB, 4 K. He threw 34 pitches/22 strikes. His fastball ranged between 94-98 mph. He walked the first batter he faced, then got his pitches under control. He set up his slider with fastballs. His 4 Ks came on pitches of 84, 86, 86, and 83 mph. Two sliders, 2 change ups? The one run he gave up scored when a two out pop up dropped among four lpayers in the infield. The runner easily scored from second. Jeff Singer entered and recorded a six-out save. His fastball was in the low 90s as he recorded 3 strike outs. He gave up a two-out, ground single in the ninth. But the hardest hit ball was a first-pitch line drive back through the box that Singer nonchalantly caught and flipped to an infielder. Combined, the three Threshers pitchers no-hit all the Blue Jays not named Dan Jansen. While Jansen went 3-4 with singles off each of the Clearwater pitchers, the rest of the Jays went 0-28 with a walk and 13 strike outs. Eflin laid out the blue print for the Threshers starting pitchers. Hold the opponent scoreless until the offense can scratch out a couple runs. And scratch they did. 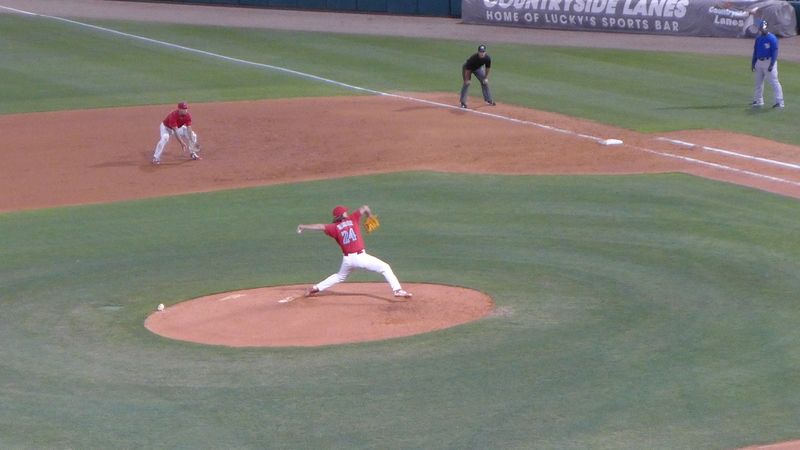 After Zach Coppola led off the bottom of the first with a walk and was caught stealing after being picked off, the Threshers didn’t have another base runner until a throwing error in the fourth inning gave them a one out base runner. Damek Tomscha punched a check-swing double off the first base bag. Jose Pujols drove in the game’s first two runs with a ground double inside the third base bag on a 3-2 pitch. The hit came off an off speed pitch. He had missed badly on the same pitch when the count was 3-1 and the ball was out of the strike zone. The Threshers tacked on another run in the fifth inning. Emmanuel Marrero reached first with two outs when he was hit by a pitched ball. He moved into scoring position when he stole second base. Zach Coppola brought him home with a ground single to center. The Threshers collected two singles over the remaining three innings. A line drive double play ended a scoring threat in the seventh inning. Aside from the five-hit support the offense provided, the Threshers defense was worrisome. They committed three charged errors, and bobbled a couple other balls that robbed them of the opportunity to turn double plays. They looked a little shaky catching a couple of other balls in the air. Hopefully, some of these can be attributed to a strong 17 mph breeze that blew from left to right. The game was completed in two hours flat. The pitch clock and inning clock were never factors in the game. Lakewood (1-0) beat Kannapolis 7-5. JoJo Romero gave up 4 of the 5 runs in his four innings, but walked none and struck out five. Mauricio Llovera was touched for an unearned run in the sixth and left with a couple runners on base. Zach Morris stranded the runners and went on to pick up the win. Ismael Cabrera picked up the save. Next up Sixto Sanchez on Friday, Ranger Suarez on Saturday, and Adonis Medina on Sunday. The BlueClaws rallied from an early 4 run deficit with 3 runs in the fourth and took the lead with 2 runs in the fifth. After Kannapolis tied the game in the sixth, Lakewood retook the lead with 2 runs in the eighth. Darick Hall drove in their first run on a sacrifice fly after singles by Brito, Gamboa, and Moniak loaded the bases. Luke Williams infield single plated the second run. And Cord Sandberg’s double brought home the third. The BlueClaws loaded the bases again in the fifth. A Luke Williams fielder’s choice and throwing error accounted for the tying and go-ahead runs. Alex Wojciechowski put Lakewood ahead to stay with a pinch hit, RBI single in the eighth. A passed ball allowed the final run to score. The BlueClaws collected 13 hits. The first 6 batters in the line up each had two hits – Daniel Brito, Arquimedes Gamboa, Mickey Moniak, Darick Hall, Luke Williams, and Cord Sandberg. Their pitchers struck out 10 Intimidators while walking only two. The BlueClaws drew one walk but only struck out 3 times. Former Phillie slugger Ryan Howard agreed to a minor league deal with the Atlanta Braves. MLB Trade Rumors has the story here. 4/6 – Phillies sent RHP Zach Eflin on a rehab assignment to Clearwater Threshers. 4/6 – Edgar Garcia assigned to Clearwater Threshers from Lakewood BlueClaws. 4/6 – Deivi Grullon assigned to Clearwater Threshers from Lakewood BlueClaws. 4/6 – Emmanuel Marrero assigned to Clearwater Threshers from Lakewood BlueClaws. 4/6 – Wilson Garcia assigned to Clearwater Threshers from Lakewood BlueClaws. 4/6 – Cornelius Randolph assigned to Clearwater Threshers from Lakewood BlueClaws. 4/6 – Jan Hernandez assigned to Clearwater Threshers from Lakewood BlueClaws. 4/6 – Cole Irvin assigned to Clearwater Threshers from Williamsport Crosscutters. 4/6 – Tyler Gilbert assigned to Clearwater Threshers from Lakewood BlueClaws. 4/6 – Clearwater Threshers placed DH Zach Green on the 7-day disabled list. 4/6 – Clearwater Threshers placed IF Derek Campbell on the 7-day disabled list. 4/6 – Blake Quinn assigned to Clearwater Threshers from Lakewood BlueClaws. 4/6 – Franklyn Kilome assigned to Clearwater Threshers from Lakewood BlueClaws. 4/6 – Seranthony Dominguez assigned to Clearwater Threshers from Lakewood BlueClaws. Welcome back Phillies Minor League sports fans. The beer is cold. The hot dogs are cooking. The popcorn is poppin’ and the pretzels are ready for consumption. Ice Cream is chillin’ in the freezer. All we need are some 20’ish guys to start throwing and hitting the ball. Wait… we have that now. Play ball!!! Alex Wojo — not even going to try to spell his last name — played LF. I thought he was a 1st baseman only when he was drafted. With Darick Hall playing 1B, I was worried about how many reps he’d get. If he can play LF too, that solves that problem. He started getting reps in LF during spring training. He’ll probably go back to first base if/when Hall is promoted to Clearwater. Jim – Thanks! Manna for the soul! I see that Gowdy, Stobbe and Ortiz appear ticketed for Williamsport. I was hoping Stobbe would be assigned to Lakewood but is it because of a position change from ss to 3b? Do you have any ideas of why? 8mark…..Joe Jordan @ 15:05 says why Stobbe starts in short…maybe LKW later. We’ll have to give him a nick name anyway. I like “Alfie the Cat”. Glad to see Eflin getting back into his groove. Velo is right up there. The knees must feel great. Hopefully when he wakes this morning there are no ‘after- shocks’. Jack: Which Phillies prospect are you most interested in seeing? This site is always fun and informative. Now, with game reports and boxscores, it’s super fun. The two things he said to me that got my attention, were the fact that Hoskins is the ‘best hitter in the system’ and, and as you alluded to on Ortiz, he will be a ‘force’. I just assumes the same questions we have on Cozens and his contact abilities, especially vs LHPs, they also have.